Brandon Davidson knows there’s always room for improvement. 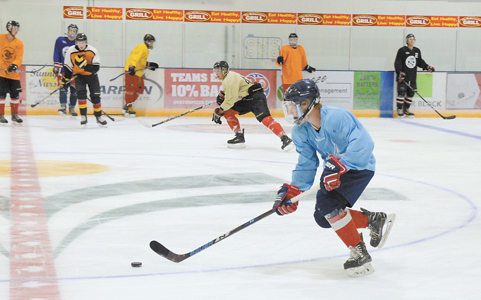 With that mindset and a new training regiment and location, the almost 27-year-old defenceman from Taber is confident that will land him a new team when the 2018-19 National Hockey League season begins. The duo were back on their southern Alberta home stomping grounds earlier this month. And he spent the last week giving back to his fellow locals. “Not many people get to experience what I have and that’s just a blessing,” said Davidson. Davidson started the season with the Montreal Canadiens before getting traded to the Edmonton Oilers, the team that drafted the six foot-two, 208-pound blue-liner in the sixth round and 162nd overall in the 2010 NHL Entry Draft. But at the trade deadline, Davidson found himself headed back east as the Oilers sent him to the New York Islanders, who didn’t extend Davidson a qualifying offer at the end of the season. That has the Taber product kicking the proverbial tires. Versteeg spent the week overseeing the camp that bears part of his last name. Like Davidson, the Lethbridge product with a pair of Stanley Cup rings during his time with the Chicago Blackhawks was also looking for a new team after not getting a qualifying offer from his former team, the Calgary Flames. Versteeg put up eight points in 22 games with the Flames before undergoing hip surgery in December. He returned in mid-March, but only played in two more games. Late last week, Versteeg signed in the Russian Kontinental Hockey League (KHL) with Omsk Avangard.